As we get older we tend to reduce level of physical activity during the day and gradually lead a much more sedentary lifestyle. Unfortunately, for most people that is exact opposite of what should be happening as we age. As this article points out, https://coach.nine.com.au/2018/07/27/19/49/older-people-exercise-fitness, leading a physically active lifestyle is crucial in maintaining good quality of life, reducing various age related disease such as osteoporosis as well as improving mental health and cognitive ability. There is an abundance of different training options if you are looking at increasing your level of physical activity during the day. Going for a simple walk can be great in improving your cardio vascular fitness, balance as well lower body strength and endurance. Around your home you can use your dining chair to help you perform functional exercises like squat or calves raises. Joining local yoga or pilates class can be another fantastic option to help improve your posture, balance and overall well being. I currently offer mobile personal training services to a number of my clients who are well over the age of 70. I have to say it was amazing and so rewarding to witness such an improvement in their mobility, confidence and overall strength after only training for a couple of month. Introduce a little bit of extra structured physical activity to your lifestyle and you will surprise yourself with the results. I was running personal training session for one of my clients at the iconic Bondi Outdoor Gym earlier today. 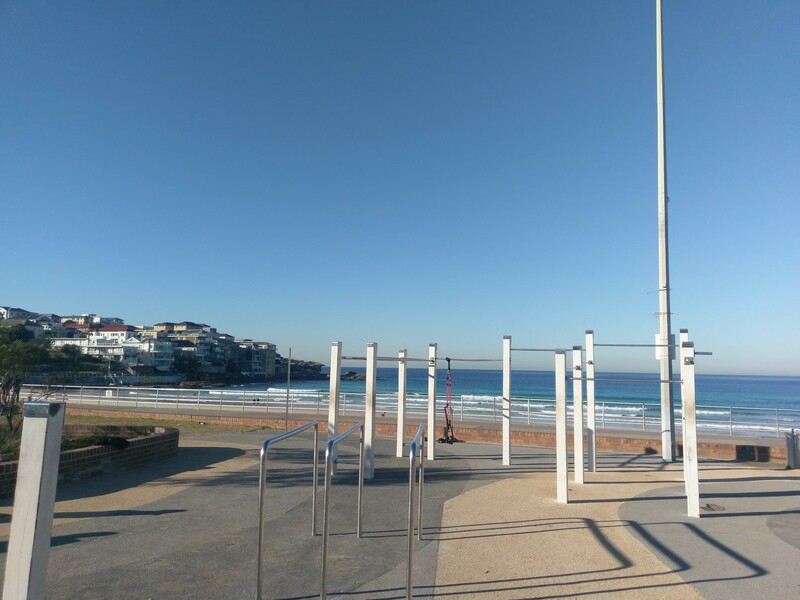 Bondi Outdoor Gym is located right in the heart of famous Bondi Beach and has quite a following. Recently this fitness hub has undergone a complete renovation and now features a wide range of various exercise equipment including chin up bar, parallel bars as well as different height steps. Lucky for us we were training early in the morning and pretty much had the whole gym to ourselves. I have to say it was a fantastic experience training there; both water views and some of the other people training at the time were truly inspiring. One guy was performing a set of 12 muscle-up straight after at least 1 minute hand stand. Never stops to amaze me just what our body is capable of if you push it in the right direction. Using swiss ball or bosu ball can help to introduce a number of intermediate and advance core strengthening exercises into your workout routine. Unlike mat pilates these exercise tools are inherently unstable and as a result can lead to more muscle engagement as well as challenging your balance and pro perception of your body in space. As the matter of fact even attempting simple exercise such as dumbbell bicep curl while standing on the bosu ball can activate your stabilising muscle groups around your trunk, legs and ankles making it a much more functional exercise. 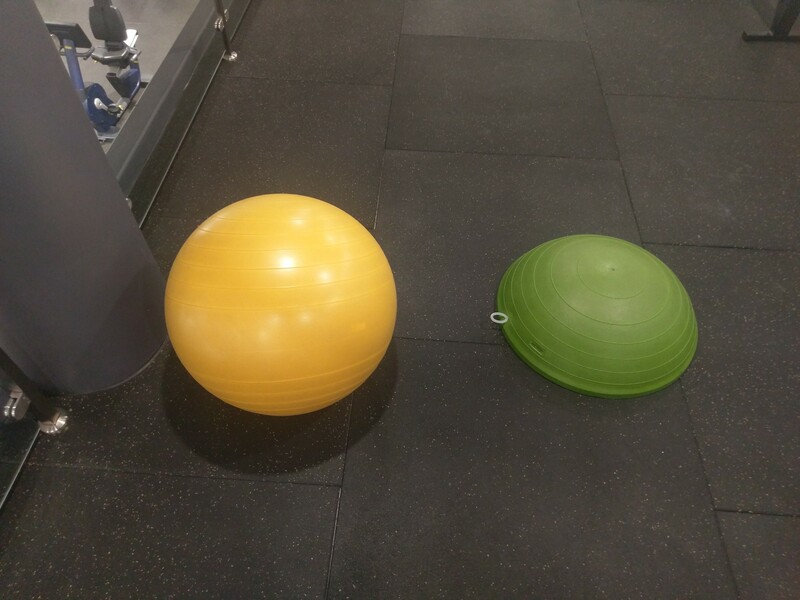 I often use both bosu ball and swiss ball in the workout plans offered to my personal training clients to further enhance core and balance strengthening as well as to add more variety of exercises to the training plan. Some of my favorite exercises using swiss ball include, knee tucks, hamstring roll outs and pliates bridges on the swill ball. All three of these exercises are great at activating your core, engaging muscles around your buttocks and hamstrings. If you like to learn how to use swiss or bosu ball as part of your workout plan please dont hesitate to schedule a personal training session. During the personal training session we can go through the list of various exercises that could be appropriate to your current level of strength and fitness, understand how to perform these exercises correctly and plan your workout plan going forward. 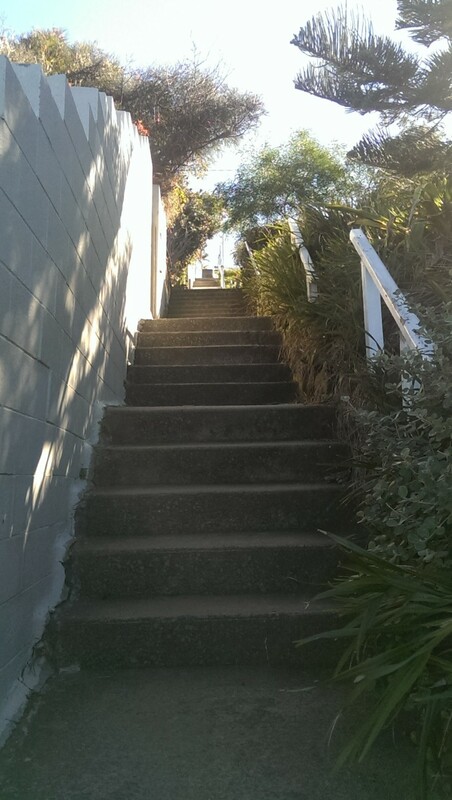 South Coogee stairs is a challenge and a half. By the time you get to the top your chest is pounding, legs are heavy and sweat will be pouring down. This is one tough cardio drill but reward is fantastic. Two pictures above demonstrate quiet clearly the view from the top and at the start of the grueling ascent. 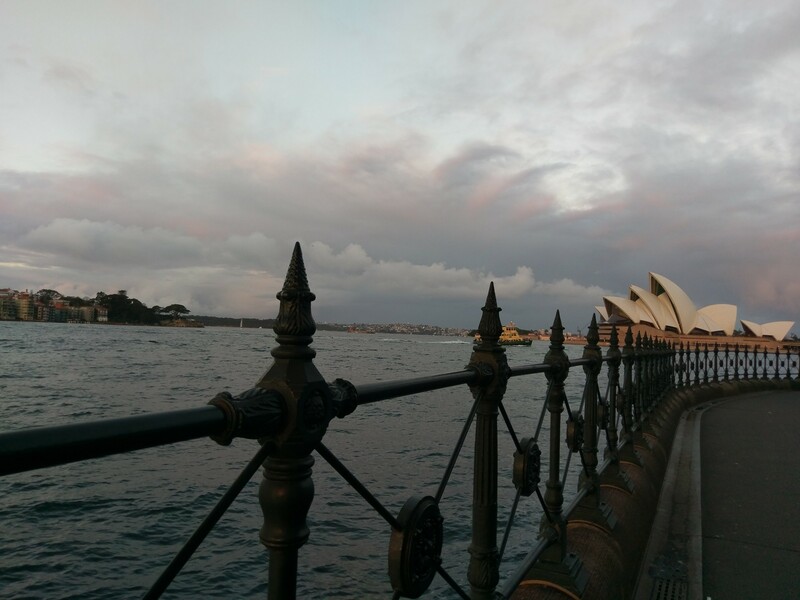 Once you do make it to the top, views are some of the best Sydney has to offer on any given day, not to mention the sense of accomplishment you will be feeling at the top. 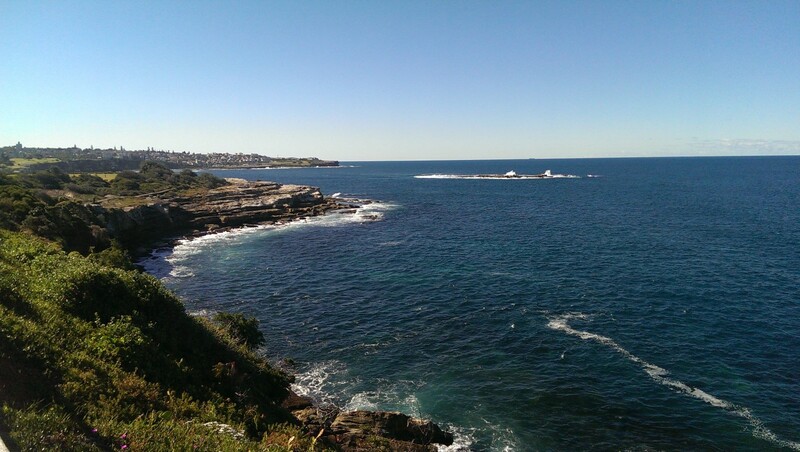 Idealbody4life personal training sessions are offered in many amazing locations around Sydney in order to both provide variety to our clients as well as take advantage of Sydneys beautiful outdoors. Recently Sydney Fitness Expo was in town and as per every year it showcased some of the latest state of the art fitness equipment. One must agree that all the flashy gym equipment looked very impressive and of course very expensive. Fitness equipment that you choose to use in the gym or in the park should reflect your long term and short term fitness and health goals. Some fancy looking machines in the gym might not necessary be providing you with a correct movement pattern and in some instances may even cause an injury over a long term use. Please remember alternating between using free weights, your body weight and gym machines in your workout plan will often lead to the best results while minimising the risk of injury. Repetitive stress on the joints can be dramatically reduced by varying exercises and equipment used regularly. Idealbody4life personal training team often develops workout plans only based around body weight exercises that can be both challenging and versatile, allowing our clients to be able to train at any location. In Sydney there is a number of outdoor workout stations that are free and do offer basic equipment such as chin up bars and benches as well some cardio vascular equipment. On the occasion these fitness spaces can be great in adding variety to your workouts and stepping outdoors away from stuffy and busy gyms. Idealbody4life personal trainers are all highly experienced and specialise in facilitating outdoor personal training sessions. Please do not hesitate to contact us to help you get started training towards your health and fitness goals. Chin up is one tough exercise to perform but also one of the most rewarding exercises to master. This exercise manages to engage most of your upper body muscles in one movement as well as your core. As thus it should be part of your workout plan if you are looking at building your upper body muscle tone and strength. From my personal experience working as a personal trainer over the last 13 years most people do not do chin ups correctly and many are too scared to even try. So let us break down this fantastic upper body strengthening exercise. We are going to focus on the pronated grip chin up, meaning your palms facing away from your body and wider grip position. This variation of the chin up can potentially help to better engage your latissumus dorsi muscles of your back. To start make sure you stand close to the chin up bar and gripping chin up bar slightly wider than your shoulders as well make sure to wrap your thumb around the bar. Before commencing any upward lift try to retract your scapulars (shoulders) down as not to over engage muscles around your neck. I would suggest coming up on your toes to better engage your muscles prior to the lift. Try not to bounce into the movement. Begin by bending your elbows and pulling yourself up towards the bar without over engaging muscles around your neck, if you can aim to touch your chest on the bar, but you can always work your way up. Make sure to breathe out on the way up and tighten your core. Continue to pull yourself up until your arms are fully flexed and pause briefly and slowly lower yourself down until your arms are almost completely straightened. Using power bands can also assist beginners when first attempting chin ups by reducing some of the weight being lifted and improve chin up form going forward. If you would like more information or help improving your chin up form please do not hesitate to contact one of our experienced personal trainers. During the personal training session one of our trainers can further breakdown correct chin up technique as well as gradually progress exercise as you increase your strength and improve your chin up form. If you are thinking of commencing training or sporting activities outdoors around Rosebery you are in for a treat. There are a great number of parks and fields around the local Rosebery area that are fantastic for a variety of outdoor fitness training activities. Sydney City Council in the last few years has committed to improving locals participation in the health and fitness activities. As the result Sydney City Council has dedicated large financial resources in installing free outdoor training facilities around various parks. Equipment installed includes a large selection of various chin up bars, benches, cross-trainer, hand bike, spin bike and suspension trainer. Thus these fitness areas are perfect for the use by anyone just looking at starting on their fitness journey to someone who is a bit more advanced and after a challenge. Just a few blocks away there is famous Sydney Park, once used to be a garbage tip and now a thriving green space. Here too you will find free fitness equipment but you can also challenge yourself running up some of the steepest hills in the area. I must say it is quite a cardio –vascular challenge by the time you make it to the top but you will be rewarded by spectacular views of the CBD. As the matter of fact some of the professional sport teams such as Sydney Roosters and South Sydney Rabbitohs come to Sydney Park to train during their pre season training. If you are a local Rosebery resident you are truly lucky to be living just next door to all these incredible green outdoor spaces. Why not get out there and start training outdoors today? If you need some help or expert advice, we specialise in providing outdoor personal training. Get in touch and one of our experienced trainers will be happy to show you how to use one of these outdoor fitness hubs and plan your workout plan going forward.